Fall is my favorite time of year. This is the start of the holiday season and when I start bringing out all of my favorite recipes. Over the years I have collected dozens of recipes. All of them are very special to me as some were passed down from family members. Others were given to me from dear friends and others are original creations that my crew have come to expect each year. I keep telling myself that one day I am going to get everything typed up and create a digital cookbook. For now they are all housed in my handy cookbook. It might be a little old fashioned these days…but it works for me! I got my porch decorated with pumpkins over the weekend and that had me hankering for some pumpkin bread. It’s just not fall without it! The recipe I am sharing with you all is from a friend of mine. 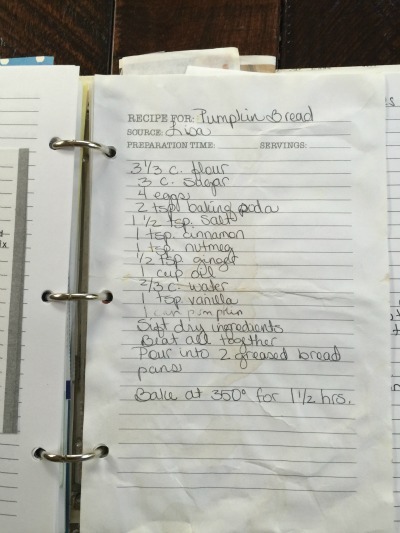 It’s by far the best Pumpkin Bread recipe that I have ever had. 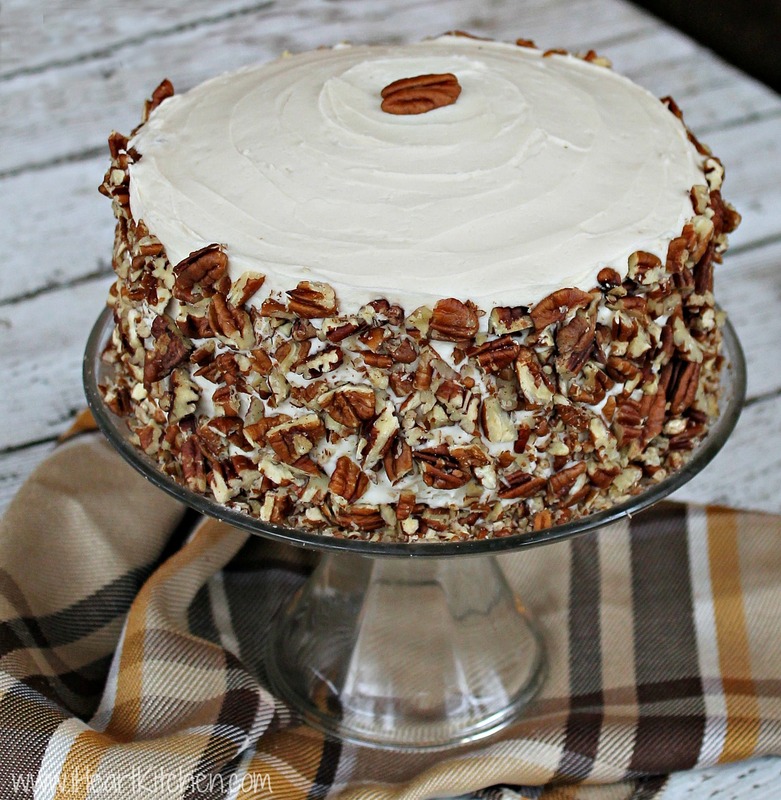 It’s moist and delicious and absolutely addicting! I have been making this one for over 20 years now. I have tried a few others from buddies who have made claims that theirs was “the best pumpkin bread ever” and have ALWAYS gone back to this one. In my opinion, this recipe really is perfection! Now, Lisa’s recipe calls for the bread to be baked in two loaf pans but I always do one big bundt pan plus a pan of 24 mini muffins and it turns out perfect. Of course you can use the batter however you wish. If you wanted to make regular size muffins, mini bread loaves or really whatever – all you’ll have to do is adjust the baking time a bit. Once you start smelling that fabulous pumpkin smell…just look for a golden crust and poke your creation with a toothpick and look for it to come out clean! Whip up a batch of this delightful Pumpkin Bread and I bet your day will be a little happier! Sift all the dry ingredients together in a large mixing bowl and set aside. Combine the wet ingredients in a large bowl or in the bowl of your stand mixer. Gradually add the dry ingredients to the wet ingredients and beat until combined. Pour into 2 greased bread pans. Bake at 350 for 1½ hours. I usually make one larger loaf using a bundt pan plus 12 mini muffins. You might have to increase the cooking time to accommodate the pan if you choose this method. 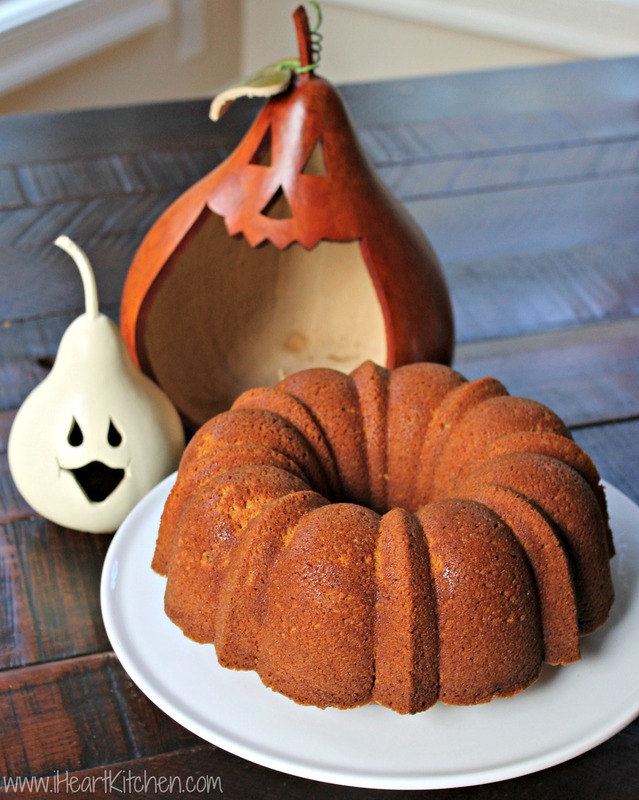 so how long do you cook it when YOU use a bundt pan? I still bake the bundt for about 1.5 hrs to 1 hr 45 min. Ovens can vary so be sure to test with a toothpick.